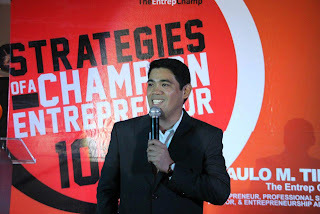 One of the sought after professional speakers today, he earned the moniker of "THE ENTREP CHAMP" in the entrepreneurship community because of his business savvy and wisdom. Paulo worked his way up the ladder of entrepreneurship and success. He is a graduate of B.S. Airline Business Administration, was a working student taking on not-so-popular jobs like utility personnel, messenger and delivery man from his freshman year until to his senior year in college. He started several enterprises like t-shirt trading, nata de coco production, handmade paper production, laundry business, and restaurant before he was able to strike the ìpot of goldî in the logistics business offering courier, freight, logistics marketing, food logistics, 3rd party logistics and other supply chain services to complete as total logistics solution provider. At present, he is the president and CEO of Vcargo group with different business units in transport, energy and logistics. 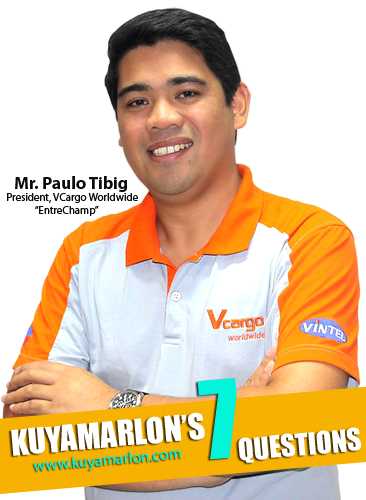 Mr. Tibig is a Go Negosyo Angelpreneur, past president of the Association of Filipino Franchisers Inc.(AFFI), Director of Freeport Area of Bataan (FAB), honorary member of the Young Entrepreneurs Society-Worldwide, and former president of Bataan Chamber of Commerce and Industry (BACCII). 1) KuyaMarlon: Who is Paulo Tibig when he is with his family and friends? Paulo Tibig: The person you see on stage is the same Paulo you'll see at home. High-spirited but grounded, simple but refined, passionate and practical, always optimistic but realistic. 2) KuyaMarlon: What keeps you motivated? Paulo Tibig: Ka-pamilya, Ka-trabaho, Ka-entrepchamp --- Just like other good parents, My wife and I dedicate our life’s work to the next-generation. Not just for our immediate family but to the families of those who tirelessly work with us. I’d like to believe that my entrepreneurial advocacy sustains itself to next generation, and just the thought of having transformed lives (not just ours) is enough motivation on its own. 3) KuyaMarlon: What is the secret of your success? Paulo Tibig: 5 Ps----Passion, Prayers & Perseverance, Planning & People– in that order. Passion fires my creative spirit; Prayers keep my faith stronger so that even at the most difficult of times, I remain undaunted and even persevere for more; Strategic planning minimizes complications and eliminates errors and you can surely go places if you have the right team with the right mix of values and skills. 4) KuyaMarlon: What advice can you say to aspiring Young Entrepreneurs who are willing to put up their own businesses? Paulo Tibig: Every aspiring entrepreneur should know that putting up your own business requires more than willingness; "ito ay hindi minamadali, ito ay pinaghihirapan" (success is not achieved overnight). 5) KuyaMarlon: Knowing your several enterprises, how do you prioritize your activities? Paulo Tibig: We plot our meetings/activities into one integrated calendar. This way, everything is covered from end to end and all key players are in the loop. 6) KuyaMarlon: Being a leader, does it need a power or an authority? And how do you influence people? Paulo Tibig: Neither. Power and authority are only bi-products of RESPECT if executed properly. A great leader has neither power nor authority if his people do not respect him. In my organization, I put values formation as a fundamental driver for making things happen. 7) KuyaMarlon: Being a public speaker and entrepreneur, what is the importance of networking/connections? Paulo Tibig: Nothing beats a good word from a colleague or a positive testimonial from your audience. Connections, whether face to face or digital, they are indelible signatures that can either make or break you in the process.